Cuttack Chandi Temple is located near the south Barabati Area of Cuttack which is about 5 kms from the Cuttack main city. The main deity of the temple is Goddess Chandi. It is believed that the image of the deity is older than the temple. 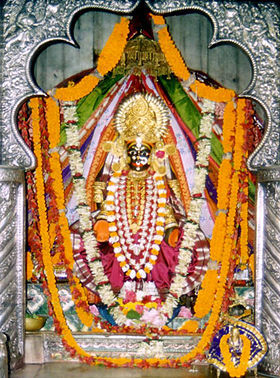 This temple is also known as Maa Cuttack Chandi Temple. The present piece of land, where the holy temple is located, was lying fallow before. Late Sri Hansa Panda, who happens to be the Purohit of the then King of Kanika, used to graze cattle’s and sheep’s in the land. One day Sri Panda was feeling tired and took rest on a heap of dry mud present there. While taking rest,he experienced a strange unusual feeling within himself. Surprisingly on the same night, The Goddess “Chandi” appeared in his dream and requested him to take her out of the land. There after he went to the King and told everything about the strange experience he had that night. With the help of the king, Late Hansa Panda dug up the same piece of land. It is being said that around forty numbers bullock carts of Red Sindoor came out while digging and then emerged The Deity of Maa Katak Chandi. Then the temple was built on the same land. 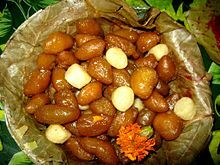 Here in Cuttack, people strongly believe Maa Katak Chandi as The Living Goddess. Late Sri Hansa Panda started worshiping the Deity with utmost Niti, Nistha, and Sradha. As per the scriptures, Goddess Chandi has four hands, known as Pasa, Ankusha, Abhaya, Bara. She is worshipped as Bhubaneswari while chanting Bhubaneswari Mantra. After Late Sri Hansa Panda, his only son Late Sri Lakhana Panda started worshipping The Goddess in the same process and procedure. He was blessed with four daughters, named Champa, Tulasi, Mali and Malati. Those daughters were also helping their father Late Sri Lakhana Panda, in the rituals (Seva Puja) of the Deity. After praying so many days, Late Lakhana panda always prayed Maa Chandi to have a son and then he was blessed with a son, named Sri Dayanidhi Panda, who also followed the footprint of his predecessors. The temple came to lime light during Sri Dayanidhi Panda. Number of devotees increased during his period. He has six sons, who are presently performing rituals (seva puja) of deity. They are namely Sri Narayan Panda, Sri Narahari Panda, Sri Somnath Panda, Sri Chakradhar Panda, Sri Loknath Panda and Sri Ratnakar Panda. The above heritary sevaks along with their fourteen sons are presently performing the Seva Puja (Rituals) in the Temple. The fourteen sons are Jagabandhu, Dinabandhu, Bikram, Gopal, Sarat Kumar, Sukhadeva, Bhagadeba, Manoj, Trilochan, Susant, Biswaranjan, Ramachandra, Pramod, Ranjit. Give Responses for "Cuttack Chandi Temple"